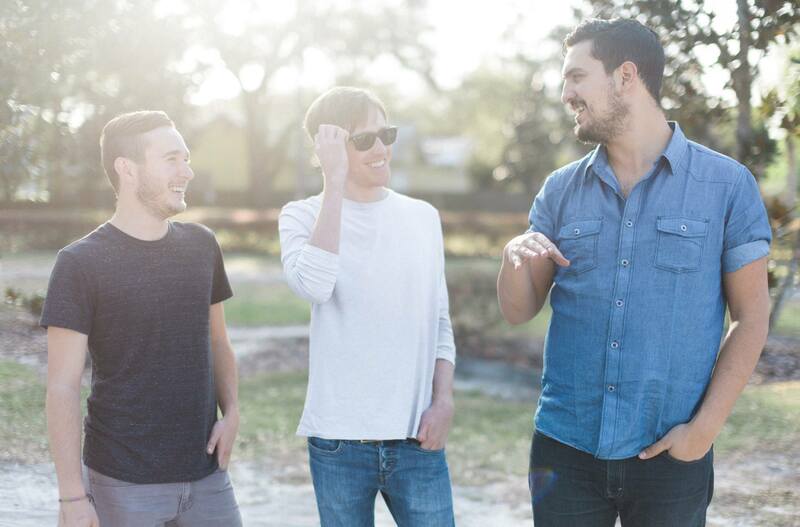 Indie rock band Lydia first came onto the scene in 2003 as a couple of kids from Arizona. Their music had brought them to stages such as Vans Warped Tour and The Bamboozle festival, playing with bands such as Metro Station, The Dear Hunter, Copeland, Lights, Eye Alaska and The Maine over the course of their career. Currently on tour supporting UK punk band Moose Blood on a spring US tour, Lydia was happy to talk with me about their new music ahead of their stop at Slim’s in San Francisco on April 4. It’s been a few years since your last release (2015’s Run Wild). What can we look forward to from your upcoming album Liquor? I think this one is a little different in the fact that we didn’t really rush anything about the process. The songs really came out organically and in their own time. Liquor tells the story of the highs and lows of that. What was the inspiration behind Liquor? What sounds and elements did you draw from? We always really enjoy the experimental aspect of creating a feeling in a song. This one was no different, we sort of just bang around on instruments and things until it makes us feel the right thing. I love your lead single “Goodside.” Tell me a little bit about that song — what inspired it and how did you choose to lead with that to introduce your album to fans? Morgan Saint is a new artist whose five-track 17 Hero EP made a strong first impression. A “moody pop” collection of songs released last fall, the new major music label signee wrote her EP in the span of one summer after graduation and a slew of life experiences. Her 17 Hero EP is named after the people in her life who have impacted her in significant ways — negatively or positively. Full of catchy synths and hard-hitting drums with memorable lyrics to match, her EP is probably the strongest debut you will ever hear from any new artist. There’s something particularly special about a new pop artist on the rise whose songs aren’t your average cookie-cutter pop. At only 23-years-old, singer-songwriter Nina Nesbitt seems to know what she’s doing. Her writing feels incredibly personal, emotional and heartfelt; her music blends elements of folk meets alt-pop and R&B; and above all, her music feels familiar, relevant and universal. Her music has the ability to capture the voice of a generation — and with up to 4.5 million monthly listeners on Spotify, it’s clear that Nesbitt is on her way up. And I couldn’t be more thrilled. The Go Ahead released their new EP, In Harms Way, on Friday night at a packed Elbo Room in San Francisco’s Mission district. The San Francisco-based band has been together for seven years, yet on Friday they played with the energy and the veracity as if it were their first show. Their set was a fusion of new songs, a few crowd pleasers, and a moment of fun with an inventive cover of Beyoncé’s “Crazy.” The hour-long set had the busy venue dancing throughout. There is something contagious about a local music scene. The way small venues can be filled with a mixture of friends, family, and fans all getting down together as if it were their best friend’s birthday. People outside wandering the streets looking for the next hipster bar, without knowing they just walked by the party of the night. It sometimes feels like a secret, and The Go Ahead are one of those San Francisco secrets we hope to share with the world very soon. London-based modern soul collective Jungle closed off their United States tour in Los Angeles — and it was fire. The seven-piece music collective played to a sold-out house of soul lovers at the El Rey Theatre on Thursday night. Their infectious live sound, infused with electronic funk and rhythmic percussions showed they know how to party. Electronic duo Makeness opened up the show before Jungle took the stage. 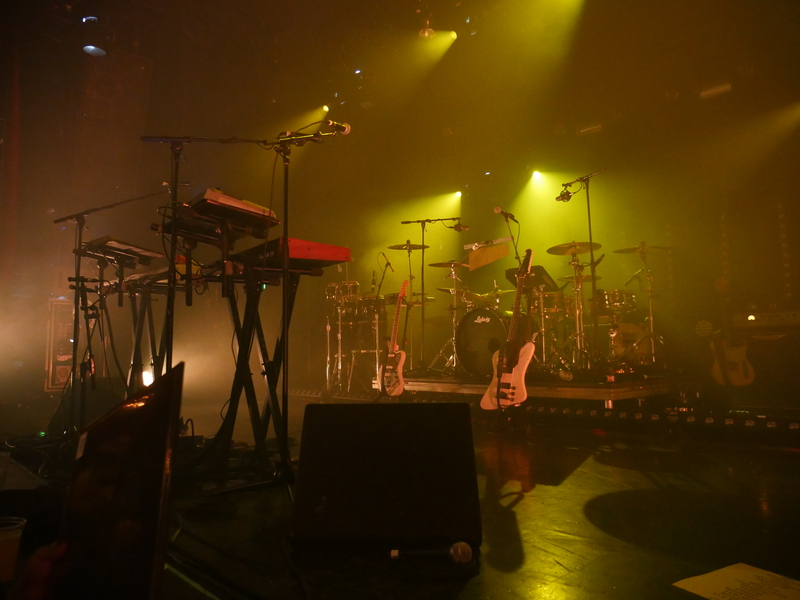 Their retro electronic synths, drumbeats and keys warmed the crowd up well; but the moment Jungle hit the stage, their big sound, sing-along verses and dance worthy songs set the whole crowd into motion. Jungle’s self-titled debut album was released in 2014 with lead single “Busy Earnin'” topping charts in the UK and France. Keep up with Jungle at junglejunglejungle.com. Check out more photos from their performance here. Morgan Saint is an artist I had the opportunity to see and meet last Wednesday night in Los Angeles, and little did I know this New York artist would be on her way to become pop music’s next big act. “Exactly a year ago today, I was on a plane from New York to LA,” Saint explained to the intimate Moroccan Lounge crowd. “I signed with the team at Epic Records. To my manager, I owe everything to you,” she said in her heartfelt homage. The singer has songs set to make her pop music’s next big act. Her infectious and tasteful production matched with a live guitar and drums were absolutely intoxicating against her vocals about love, broken relationships and friends. “YOU,” the debut single from Saint’s 17 Hero EP is a “moody pop” hit that is both catchy and haunting with tight production, finger snaps and lyrics that cut deep. Saint’s effortless set with songs played to a tight-knit legion of fans, supporters and her label family make it easy to see that her music is going to catch onto the world. With new songs on the horizon and an impeccable sense of writing and artistry, we’re more than ready for Saint to deliver on songs that make us feel a little something, but also take us away to musical euphoria. Saint made her debut at the Rickshaw Stop in San Francisco on Friday, December 1st as part of POPSCENE with DJ Aaron Axelsen. Her 17 Hero EP is available now on Epic Records. Stay connected with Morgan Saint at morgansaint.com. 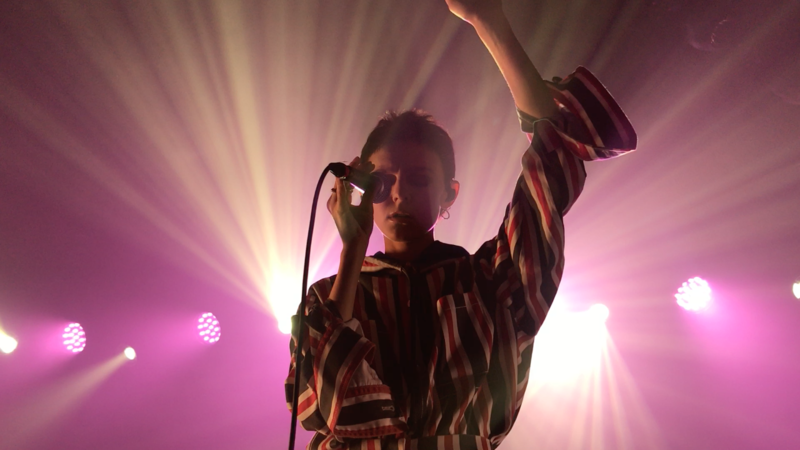 Indie pop band Cults brought their synth pop melodies to the Teragram Ballroom in Los Angeles last Tuesday, November 7th and put the crowd into a daze. Known for their breakout hit “Go Outside,” which first gained them the attention of fans worldwide, Cults has gone on to make more music since 2010, with the release of their third full-length album Offering in October of this year. Founding members guitarist Brian Oblivion and singer Madeline Follin were accompanied by a full band with drums, bass, keys and synths on tour — and as mesmerizing as their music was with projected visuals as accompaniment, their live performance couldn’t have made me any sleepier. I’ll give it to the Cults though: they’ve got some good music and great recordings, but I’d pass on seeing their live show again. Jaymes Young’s moody electro-R&B sounds feel perfectly familiar and unfamiliar at the same time. With the ability to blend alternative rock, electronic pop and soul all into one, the Seattle-born artist’s moody sentiments on love and relationships are incredibly raw and carefully crafted. With a background of growing up in Seattle and residing in Los Angeles, that scenery seems to fit Young’s music perfectly: his clear-cut vocals are tinged with emotional vulnerability; his production is lush and tight, giving steadiness to his synth pop melodies; and his songs blend elements of upbeat synth percussions and tender pop to heartfelt lyrics. Young made a stop at the Fox Theater in Oakland to open up for British pop duo Oh Wonder on their Ultralife World Tour last Thursday night — and it’s just a matter of time before the world catches onto Young. With a liking to Coldplay meets Iron & Wine and Death Cab For Cutie, Young’s music is perfectly textured and catchy. It’s moody and raw, vulnerable and deliberate. The singer-songwriter and musician began writing at the age of 14 and received the attention of critics with his Dark Star EP in 2013. With his debut album Feel Something released this past June, Young has been pushing his music out to listeners new and old. You can keep up with everything Jaymes Young and purchase his debut album Feel Something at jaymesyng.com. “It feels like we never stopped,” guitarist, cofounder and cowriter Marc Walloch of the indie rock band Company of Thieves said to me in an interview on Saturday. The Chicago-born trio, made up of singer and founding member Genevieve Schatz, Walloch and bassist and keyboardist Chris Faller, reunited this September to play a slate of shows nationwide to celebrate the 10th anniversary of their debut album Ordinary Riches. They ended their 12-show run with a hometown show in Los Angeles at the Troubadour Saturday night. After being on hiatus for three years, the band spent that time discovering their own solo careers — Schatz released a solo EP Show Your Colors in 2013 and Walloch released Through The Seasons under the moniker Spill. As the band quickly became a favorite among the Chicago indie rock scene, only then to be discovered by Wind-Up Records in 2009 with a follow-up release Running From A Gamble in 2011, the band’s legacy and music has stayed. “We would run into each other around town and see each other at shows and realize we missed playing,” Schatz said. Thee Oh Sees have recently made some lineup changes now thrilling crowds as Oh Sees, but for four shows (two in LA and two here in SF) they are OCS, a unique lineup for a great cause. The band features John Dwyer, Brigid Dawson, Tim Hellman, Paul Quattrone and Tom Dolas. And as a special treat, they’ve added a stellar string section featuring Heather Lockie, Eric Clarke and Emily Elkin. Thee Oh Sees have always been a can’t miss show, but in December we are being promised a bit of a departure with a mellow set while supporting our city. Joining OCS is Ty Segall with a special acoustic set. It’s impossible to talk about the heyday of SF Garage without Thee Oh Sees or Ty, making this a dream show for most fans. It is crazy to me that I wrote two paragraphs about a show and I’m only just mentioning Ty Segall. His charisma, song writing and deftness on the guitar are legendary. Add to the lineup Shannon Lay who has her own rock-solid garage rock bonafides in addition to an amazing new album (seriously go listen to Living Water) and you have a show that only a fool would sleep on. It’s all for a good cause and you can get in for just $25 (plus fees). This is a unique experience and you can get your tickets here.